disclosure: I was given passes to jump at AirHeads for compensation for this post. All opinions are my own. How fun would it be to jump with Santa! My son would love it! We have more fun when we go to AirHeads. 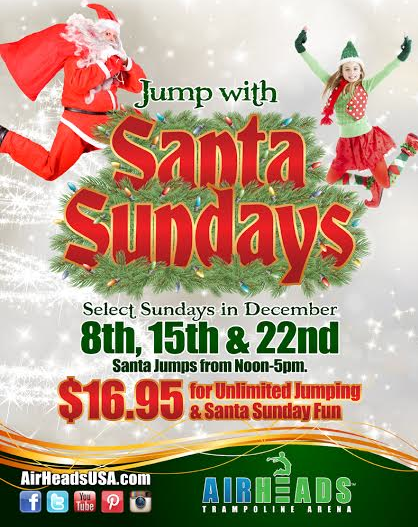 The idea of kids jumping with Santa makes me want to go just to see it! What a great idea! Did you know that AirHeads even has workout classes? I have to try one! Register for a chance to win a family four pack below! I wish I lived closer to take advantage of this! Never tried a trampoline workout, but I bet it would be fun and exhausting. Didn't even know there was such thing as a trampoline workout! Seems pretty decent though!